The DuraVision FDF2304W-IP does not require a PC, software, or other hardware to operate, significantly reducing the time, costs, and labor of installation. This also allows the monitor to be positioned freely with simplified cable management. The monitor’s web API supports customizable integration with the local video management system (VMS). This allows operators to assign a specific response from the monitor to automatically occur based on a preset time schedule or when a particular event takes place. In addition, a direct connection through RTSP stream is available (Direct URI). 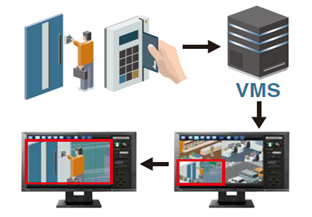 For Genetec Security Center VMS compatibility information, click here. Live streams sent from multiple locations using a decentralized recording solution, such as edge recording or cloud archiving, can generate additional traffic to the local network. 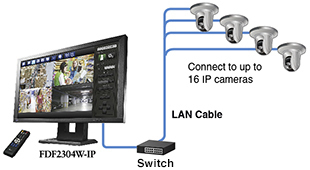 Connecting IP cameras directly to the monitor allows for the live streaming of video separate from the recording solution, alleviating data traffic. Furthermore, the monitor also provides a solution for scenarios which require live streaming but where the storage of recorded images are not permitted. IP decoding monitors support cameras with ONVIF Profile S, Axis VAPIX, and Panasonic Protocols for flexible installation and ensured interoperability with a wide range of products. In addition, a direct connection through RTSP is available (Direct URI). 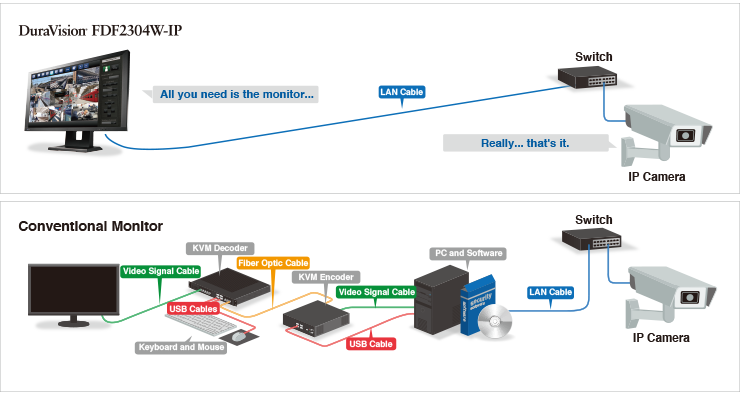 The monitor displays the video feed from up to sixteen separate IP security cameras via LAN cable for efficient video management. Images are displayed in real time so operators can assess any situation quickly. 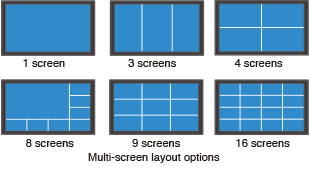 Fulfill your individual viewing needs with flexible arrangement of up to 16 screens in a custom layout. Merge individual video feed windows to focus on specific areas, or split them to see more on a single screen using the intuitive user interface. Videos can be viewed in the original aspect ratio or stretched to fill the customized space. EIZO’s unique technology called Visibility Optimizer includes a number of functions for improving the clarity of images in security & surveillance environments. Low-Light Correction detects areas of the screen that are dark and difficult to see and adjusts the brightness of each pixel. This reproduces highly visible images with a realistic sense of depth by brightening dark areas while keeping lighter areas from becoming washed out. 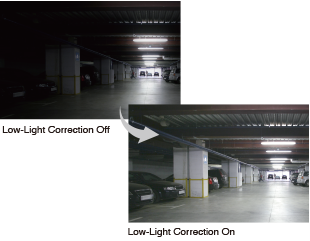 Individually optimize Low-Light Correction and Outline Enhancer settings for up to 4 connected cameras in any layout. This is helpful when multiple cameras are used in environments with differing ambient lighting conditions. The wide dimming range of 3 cd/m2 up to 300 cd/m2allows you to adjust to the appropriate brightness level for viewing in dim or changing ambient lighting conditions. Day and Night preset modes are optimized for displaying images under different environmental conditions throughout the day. You can easily switch between modes with the included remote control. The monitor reproduces smooth images by converting an 8-bit input signal to 10 bits within the monitor and selecting the optimum color values from a 10-bit LUT. The optimized data is then converted back to an 8 bit output signal, resulting in smoother gradations. This is helpful in identifying difficult to distinguish people and objects. Images are displayed pixel-by-pixel in full high-definition (1920 × 1080) that fills the entire screen. Images taken with a full-HD camera maintain fine detail when viewed on the monitor. A VESA mount option is also available for mounting the monitor onto walls or other surfaces. The monitor is equipped with a safety lock that can lock it in place on a desk or other surface, preventing the monitor from being knocked over or removed. The monitor includes settings to reduce the amount of block noise that occurs due to video compression. The monitor uses a non-glare IPS panel with wide viewing angles for minimal color shift and contrast change no matter where the monitor is viewed from. This ensures accurate color reproduction and clear visibility all the way to the corners of the screen. An overdrive circuit accelerates gray-to-gray response time to just 8 ms which minimizes ghosting and blurring during high motion video capture for clear video reproduction. The monitor is equipped with an LED backlight to regulate brightness and make flicker unperceivable. 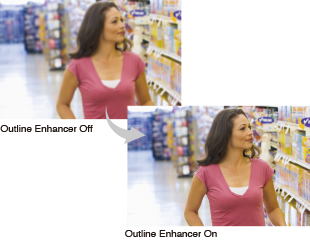 This greatly reduces eye fatigue when viewing the screen for extended periods of time. The AC power supply is built-in so you can connect easily with only one power cord. The monitor is built for 24-hour use and is backed by a two-year manufacturer’s warranty for long-term reliability.